Late Night TV was hopping last night. Kanye West and Jimmy Kimmel were hashing out their differences over on the latter’s chat show, and Tom Hanks was on The Colbert Report. 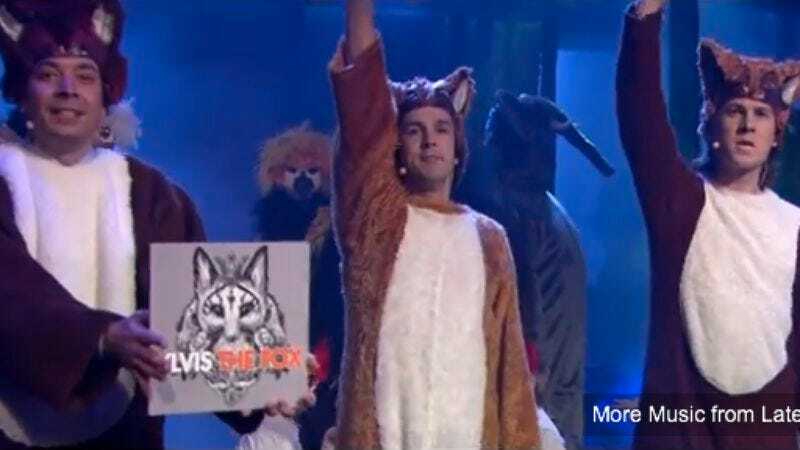 Things were a little sillier on Late Night With Jimmy Fallon, where the giggly host managed to work in both a performance from Norwegian group Ylvis, as well as a “live music video” of the group’s biggest and only hit, “The Fox” The clip is positively off the wall, with the band, host, and The Roots clad in fox garb, and a bunch of other Fallon staffers dressed as elephants, owls, and dogs. It’s incredibly weird, but that should go without saying.